From its golden, sub-tropical beaches and pulsating cities to the iconic wildlife of its savannah and bushveld interior, South Africa is a land of outstanding natural beauty and cultural diversity. In the shadow of Table Mountain’s mist-shrouded plateau, dynamic Cape Town’s rich mix of cultures, cuisines and landscapes provides a spectacular introduction to a country aptly nicknamed ‘The Rainbow Nation’. Linger for a few days, just to take it all in, before swapping city life for the Cape Wineland’s bucolic charms. Then, choose your path along the Garden Route, perhaps stopping to watch whales play in the surf off Hermanus, or heading north to the mountainous Klein Karoo before taking in stunning coastal panoramas and pretty seaside towns en route to the Eastern Cape’s Big Five game reserves. Wildlife takes centre stage again in the magnificent Kruger National Park, a region of winding rivers, deep gorges and open plains host to a plethora of winged, whiskered, toothed and tusked creatures. Here, at some of the continent’s most luxurious safari lodges, it’s possible to escape the crowds while enjoying everything from private plunge pool soaks to spa indulgences and gourmet dining, all interspersed with ranger-led bush walks and thrilling 4wd game drives. Finally, watch as the stark landscapes of Namaqualand burst into bloom before exploring the rugged beauty of the Drakensberg Mountains and the compelling history of the Zulu Battlefields. And to round it all off? Laze on KwaZulu-Natal’s idyllic coastal stretch where swaying palms frame golden sands and the shimmering blue of the Indian Ocean. And, it’s all just a stone’s throw from neighbouring Mozambique. Pair the headline acts of Cape Town with some off-the-beaten track luxury in Paternoster and the spectacular Bushman's Kloof Wilderness Reserve. Follow in the tracks of kings and presidents with a trip aboard the stunning Blue Train, its 19th-century luxuries linking the beach-clad joys of Cape Town with an all-inclusive Big Five safari. Return from expert-led game drives in a private reserve to four poster beds and gourmet meals. The Wexas staff member who dealt with my trip to Johannesburg was knowledgeable, helpful and efficient. I was particularly impressed when he asked me if he could call me back because he wanted to check the location of the hotel we were discussing in relation to the Wanderers cricket ground. He checked, rang me back in five minutes by which time he had both checked the location and found out that the hotel would provide transport to the ground. And the hotel that he recommended was excellent in quality and service-and I am sure that I would not have otherwise found it. Great service, as usual from Wexas. 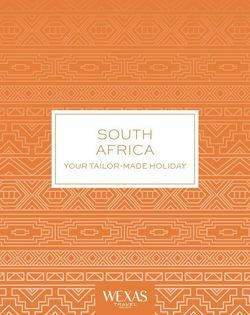 Alison Nicolle, who has arranged all my trips to South Africa since 2009, worked particularly tirelessly on my behalf this year, when my chosen itinerary turned out to be a nightmare in terms of finding the right accommodation at the right time. Her expertise is second to none, and I can't thank her enough. Right from my initial contact with Wexas I have received absolutely wonderful attention and service. Any queries I had were dealt with very quickly and efficiently. I would highly recommend Wexas to everyone. Uncharacteristically, I didn't plan this holiday myself, but put my trust in Wexas. It was a good decision and both the itinerary and accommodation proved ideal. This was a fantastic holiday and everything went like clockwork, we were away for almost 5 weeks and enjoyed every minute - thank you. I have already praised Alison! Her advice was spot on. Everything exceeded expectation. Very efficient and reliable service. No hitches or glitches! Without a doubt one of the most famous and iconic hotels in Cape Town, Mount Nelson is set on the lower slopes of Table Mountain and within nine acres of lush gardens, just minutes from the fashionable Victoria & Alfred Waterfront and Cape Town’s stunning beaches. The luxurious safari lodge, Dulini River lodge is located in the western sector of the Sabi Sand Game Reserve under a leafy evergreen thicket, ebony trees and upon the banks of the seasonal Sand River. Positioned within a precinct of heritage buildings the prime hotel location boast some of the finest retail outlets and designer stores, restaurants, craft markets and cinemas alongside boat cruises to Robben Island and entertainment in the amphitheatre. Boasting a true and authentic feeling of African history, Kirkman's Kamp is located high on a ridge, offering incredible views that span across the Kamp. Cape Town, the Cape Winelands and the Garden Route provide rich culture, spectacular landscapes and incredible cuisine, while the great wildlife reserves of Kruger National Park, the Eastern Cape and Northwest Province offer Big Five game drives and some of Africa’s finest luxury safari lodges. Kruger National Park is one of the largest wildlife sanctuaries in the world and is home to more animals than any other reserve in South Africa. The Kruger Game Reserves offer prestigious lodges and game viewing and plenty of free roaming wildlife including the Big Five. Gateway to the Rainbow Nation, Cape Town is famed for its natural beauty, diverse culture, fine wines and celebrated restaurants. It's also a city made for outdoor living, with a host of adventure activities right on its mountain-framed doorstep. South Africa's Garden Route passes through many lovely towns on its way from Cape Town to Knysna. For many, Plett is the epitome of the Garden Route, with white sands, clear waters, forest-clad mountains and fabulous seafood within easy reach. From the dramatic sandstone peaks of its Drakensberg Mountains backdrop, KwaZulu-Natal’s spectacular setting spills down through wildlife-rich wetlands and grasslands to the pristine beaches of its Indian Ocean coast. Whether you’re seeking the Big Five on a wildlife safari, looking to lounge in a five-star hotel in glittering Cape Town, heading for a tasting at an esteemed wine lodge or something else entirely, we can help you find the perfect South African holiday. From beaches to safaris, wine tours to luxury lodges, these holidays offer you a selection of fine honeymoons sure to provide a lifetime of memories. Take to the road and discover South Africa for yourself. Get up close and personal with the wildlife, cruise along the coastlines and discover a unique culture all at your own pace. Renowned for its abundance of wildlife, South Africa is the ideal destination to experience a safari holiday like no other. Go in search of the Big Five at any one of the spectacular national parks and game reserves, including Kruger, Sabi Sand and Phinda. Colourful, interesting and alien to most visitors, South African food has the potential to be the highlight of your trip. Paired with the first-rate wines available on vineyard tours, restaurants or simply in bars, and you'll see why South Africa's food and wine fame is known the world over. We take a look at the world's best driving holidays, with everything from Iceland's geological drama to America's greatest road trips. Each has been carefully selected by our destination experts, reporting back from the road. Whether it's the old world charm, luxurious surroundings and service or the incredible sense of place that comes with train travel, the option remains one of the most sophisticated and sought after modes of travel around. A rundown of the top-ten destinations for 2019, curated by our specialists. There's everything from South African safaris in KwaZulu-Natal to Antarctic Cruises and Californian road trips. After months of speculation and fears of the arrival of Day Zero in Cape Town, the effort of local residents and the tourism industry over recent months have brought it to a halt and tourism is now thriving in the city again.